Benjamin Hollander was born in Haifa, Israel and as a boy immigrated to New York City. He presently lives on the west coast of North America. His books include: In the House Un-American (Clockroot Books/Interlink Publishing, Spring, 2013); Memoir American (Punctum Books, Spring 2013);Vigilance (Beyond Baroque Books, 2005); Rituals of Truce and the Other Israeli, (Parrhesia Press, 2004); The Book of Who Are Was (Sun & Moon Press, 1997); How to Read, Too(Leech Books, 1992); and, as editor, Translating Tradition: Paul Celan in France (ACTS, 1988). A review of In The House Un-American can be found in The LA Review of Books, and an excerpt in The Brooklyn Rail. I tell them I teach writing and literature. After that, it depends who is asking. If they look like they could be remotely interested in poetry, I tell them I write poetry, although I never claim what Laura Riding called the poet-role (i.e. “I am a poet”), in the same way I would never claim Rimbaud’s Je est un autre (“I am the other”). Or, perhaps, if I were not trying to be funny, I would ask them what do you think I do and what do you think that means? And then we could have a dialogue. I don’t like the word “successful”. The word has been gutted by insiders, bean counters. Once people use it, they start measuring it — then it becomes statistically framed, and the bottom line it points to is the line we slouch towards. I don’t know what to expect from success. American naïve optimism is linked with people talking about their goals: “that’s one of my goals,” I hear people say. Life turns into a set of goals: a check-off list. It appears that in our culture one cannot be taken seriously unless one has a set of goals. So the question is, today: when so many people assume confidence breeds success, how can a man of achievement, of success, be “capable of being in uncertainties… Mysteries, doubts, without any irritable reaching after fact and reason….” It seems Keats was comfortable with a paradox we cannot even begin to imagine. So how come most readers of poetry in English, particularly after 9/11, have no clue of Shelley’s “Revolt of Islam” embedded in the history of the language from which we can learn? Should we say the poem was not “successful” enough to reach our consciousness and teach us something, particularly after 9/11 and at the moment the American government began its eternal war on terror? Has the Marx Brothers’s Duck Soup made it to YouTube? My ancestors I never knew, if you’re talking about any relatives beyond my father and mother, born, respectively, 1912 and 1914. Those grands mostly died in the Holocaust, so, unlike my peers in America when I arrived on these shores, I had to invent ancestors while they visited them on weekends. Even if I was not thinking of them, my ancestors became ghosts as soon as my friends told me they were seeing theirs. The experience felt like an alien fact I had no choice but to face, not even an emotional event. Given this absent history, I once heard a story of one of my father’s cousins, Friedrich Hollander, who wrote the lyrics for Marlene Dietrich’s “Falling in Love Again,” and who could have had a cousin who was a furrier with money, although that was another Hollander clan since mine usually follows the financial spiritual path named by Michael Gold’s 1930’s social realist novel, Jews Without Money, one of the most singular book titles in 20th century literature. Sadly, I recently discovered that Dietrich’s librettist was, indeed, no relation, but he does make a good story about how music, historically, has informed my life. 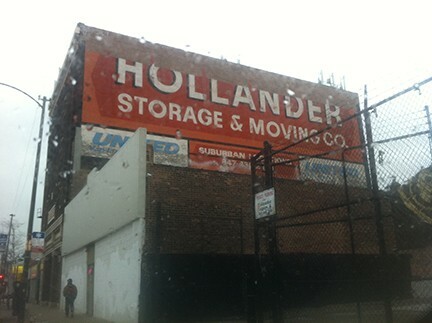 Recently, I was given this sign from above in Chicago, (Hollander Storage and Moving) and thought perhaps this was part of my ancestor’s story, which I never knew, since my father (Rolf David…) became, after being fired for the crime of being Jewish in 1933 Berlin, a refugee and always on the move, what Hannah Arendt called an “un-person.” I could understand the moving but not the storage — the family stored nothing — so ditched the idea that this could be the Chicago Rolfian Davidian Branch of the family. First, Mickey Mantle — 1962 NY Yankees Centerfielder, American League All Star. What did I want to be? Kelso, 1962 (Mute) Horse of the Year. I would never have a week in the wilderness, and it would never be ideal. My ideal is in the city. Maybe in the wilderness, where I would never go. Unless I took a talking horse, of course, to set the mood. Person on cellphone crossing a street (no traffic light here) O so slowly walking and then stopping for a second in the crosswalk to make an exclamatory point on the phone and this is why the driver in the stopped car is waiting and waiting as if for Beckett’s Godot. Some of these signs and elocutions reflect the libertarianist at the heart of America. So, in America today, I feel and fear forms of libertarianism dominating the psychology of a wide range of people, even if the party politics of this philosophy has not yet gained a massive groundswell. It will, because people don’t like to be told what to do, which is understandable, and have no socially conscious outlets for their frustrations. Unfortunately, America is ripe for the emergence of an “I wanna do what I want with my life and no government should watch and tell me what to do and I am responsible only to myself” political philosophy that will hit the ground running. The irony, of course, is that anarchism represents the same philosophy but with a beautiful catch: in the midst of having maximum individual freedom, I must show maximum social responsibility. I use the skateboarder example — the kid who wants to skateboard anywhere but the law says no, your “freedom will be restricted to gated parks. School zones, business districts don’t want you in their space.” So what could he do? Well, in an anarchist inspired moment, he might propose to a school board or business district how a collective of skateboarders could devise an imaginative plan or hold events to actually orient and attract locals to open classrooms held in the park across the school or to support the business district. So it’s how one’s social conscience informs one’s desire for freedom which separates the anarchist from the libertarian. I forget too much detail, although I remember moods, environments, emotions: I have a large remembered fondness for water locales: at 5 years old, at 2 AM, being taken in the back of jeep off a side road (which at the time passed for major highway in Israel) down a hill through tangled branches towards a beach in Haifa; or later in life in Queens, New York, taken on outings with my father to swim in Jones Beach; or, as an adult with my family visiting family in Long Beach on Long Island, in New York. I leave that romantic ideal to younger people. I think if you burn the facts long and hard in yourself as crucible you’ll come to the few facts that matter. And then fact can become fable again. America was fable before it became fact…. Given what Johnson said, I would make it a law for people in “the Bay Area” to name, when asked, exactly the city where they live. None of this east bay or north bay or south bay horseshit. Let no one from outside the Bay Area actually think these people who say they live in the Bay Area are even close to living in what San Francisco IS. If they were really proud of where they were from, they’d name their city, and the reason they don’t is they don’t want to be embarrassed by saying Walnut Creek or Concord when they know that if they claim they are from “the Bay Area” someone from outside California might be really impressed and think they’re actually from San Francisco (or close to it in spirit), which they’re not, because San Francisco IS and, well, they are not — from it or its spirit. In the Summer of 2006, rockets were coming from southern Lebanon across the northern Lebanese/Israeli border into Israel, about 45 miles from Haifa, the 3rd largest city in (the north of) Israel, where I was visiting my mother. But things decay, reason argues. Real things become garbage. The piece of lemon you shellac to the canvas begins to develop a mold, the newspaper tells of incredibly ancient events in forgotten slang, the boy becomes a grandfather. Yes, but the garbage of the real still reaches out into the current world making its objects, in turn, visible — lemon calls to lemon, newspaper to newspaper, boy to boy. As things decay they bring their equivalents into being.Things do not connect; they correspond. That is what makes it possible for a poet to translate real objects, to bring them across language as easily as he can bring them across time. That tree you saw in Spain is a tree I could never have seen in California, that lemon has a different smell and a different taste, BUT the answer is this — every place and every time has a real object to correspond with your real object — that lemon may become this lemon, or it may even become this piece of seaweed, or this particular color of gray in this ocean. One does not need to imagine that lemon; one needs to discover it.